I've only had Pasta Primavera once in my lifetime and since then, have never ordered it again as vegetables drenched in a heavy cream-based sauce is just not my cup of tea. But then, I chanced upon Giada de Laurentiis' Pasta Primavera recipe and her version sounded so tempting, I just had to try it. 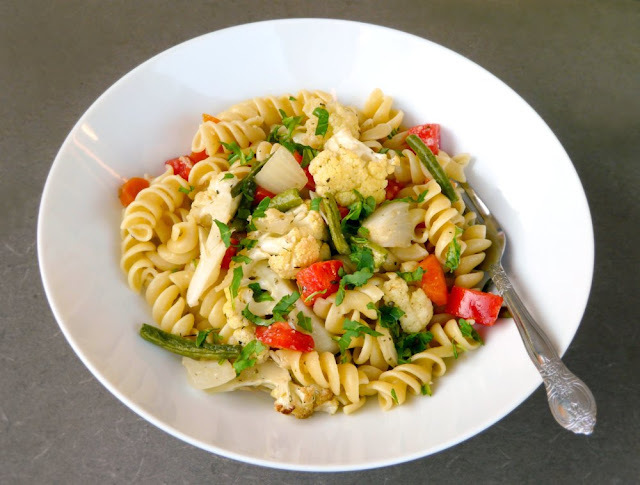 There's no cream in her recipe but what it does have are seasoned, oven-roasted veggies tossed with pasta and finished off with grated Parmesan cheese. I adapted her recipe to suit my family's taste because not everyone in the family likes some of the vegetables that were called for. 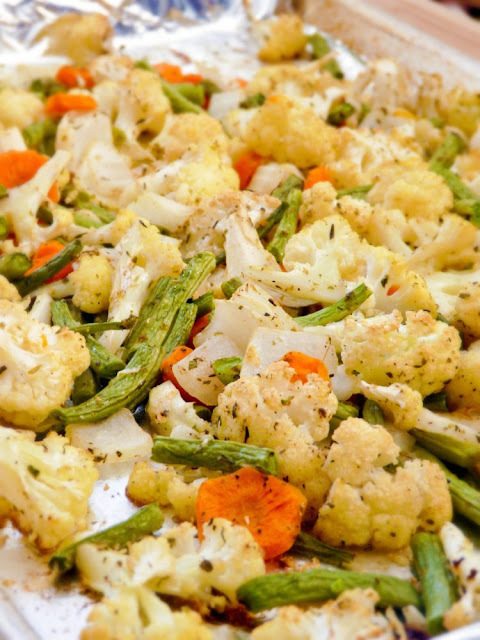 Instead, I used green beans, carrots and cauliflower. 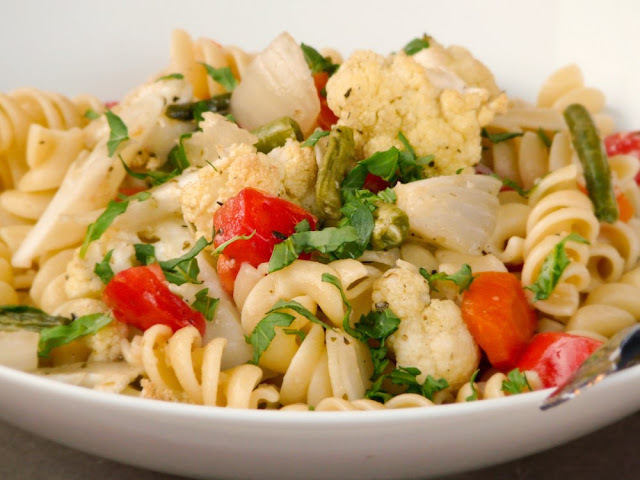 Definitely use vegetables that you love or enjoy because their flavors will really shine through in this dish. This made for another quick weeknight dinner but above all, it was light, satisfying and healthy. Adapted from Giada de Laurentiis, serves 4 to 6. In a large bowl, toss all of the vegetables with the oil, salt, pepper, and dried herbs to coat. 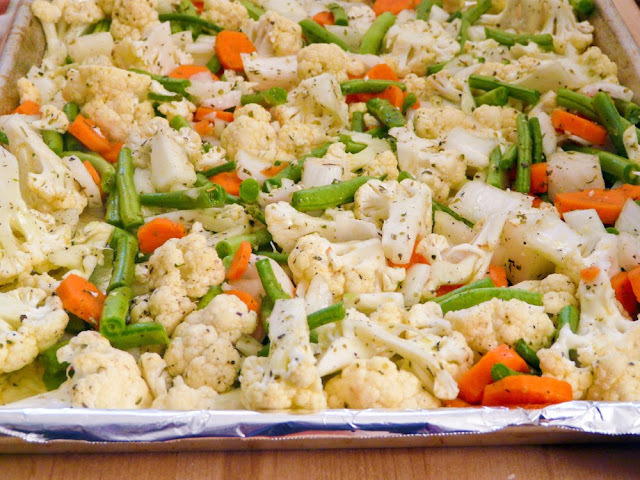 Transfer them to a large baking sheet and arrange evenly over the baking sheets. Bake until the vegetables are tender and begin to brown, stirring after the first 10 minutes, about 20 minutes total. Meanwhile, cook the pasta in a large pot of boiling salted water until al dente, tender but still firm to the bite, about 8 minutes. Drain, reserving 1 cup of the cooking liquid. 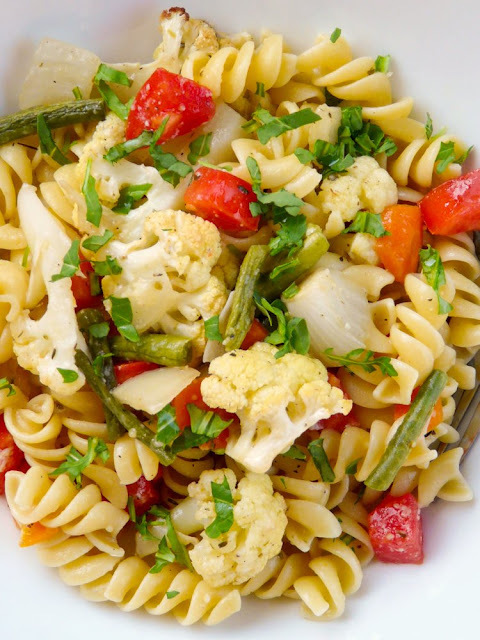 Toss the pasta with the vegetable mixture in a large bowl to combine. Add the chopped tomatoes or cherry tomatoes and enough reserved cooking liquid to moisten. Season the pasta with salt and pepper, to taste. Sprinkle with the Parmesan cheese and chopped arugula and serve immediately. Seasoned vegetables about to go into the oven. Here they are, just out of the oven...tender, yet still a little crisp. Top with chopped arugula, parsley or your favorite herb.